I mentioned in my L post that Scrivener has a name generator that I haven’t used yet. I have used baby name books in the past though (and kept back a few for the real thing if/when it happens). I currently have about 30 named characters in my novel and I can’t really remember how I came up with many of their names but oddly I think they fit and I wouldn’t want to change them now. So Shakespeare I’m just not sure if I agree with you. I’m just going to highlight a few of them now. I chose Jane Thomas as a plain ordinary name even though she is the heroine of the book. I think I wanted to highlight that anyone can be placed in an extraordinary situation and also (considering my M post) that anyone can experience mental health conditions. I already mentioned naming the Forensics teacher after two of my friends and another few friends’ or friends’ kids’ names have slipped in the book, sometimes just because I love the name but often by virtue of a name check. I’ve still got a few to get in maybe, though it would seem odd to have them all as main characters, and in some respects would destroy the world building a bit (if you don’t end up named in this one I am hoping this will be a series, plus you’ll be in the dedication). Skye (who you’ve yet to meet) is a name I just really like (a shortened version of Skylar). When I decided her character was a bit of a hippy her surname popped up and Skye Rain was born. The biggest name related comment that came back from the beta-readers was about the Commander’s surname being Trainer and him being, well, a trainer. The Academy is set on a block named after him ‘Trainer’s Place’ and I just can’t let go of it. I know it maybe seems a bit cheesy but I find it hard to hear him have any other name. I guess another thing is because Jane doesn’t take his name it almost makes it hurt twice as much that it starts with the same initial. It’s not just people that get named but places and things. There’s a club called The Rainbow Room, a hamster called Schwartz and some medication named after Ian Rankin (because randomly I’d just started following him on Twitter and his name stuck in my head). So one of the drugs Jane takes to control her mania is called Rankinex! The other name thing I want to mention is pen names. Am I odd in wanting to use my own birth name? Even if I’m married by the time I publish it (you never know miracles might happen)? I could use my twitter/blog handle but that would just be odd! How do you come up with your names (character or pen)? Do you find the same ones popping up in different stories that you’ve written? (I have a Skylar and the surname Trainer in a short story that I sent off at the same time as my Novel sample). Have you ever been made to change a character’s name and how did you handle that? In preparation for Thursday’s Q post I’m asking for your questions here. 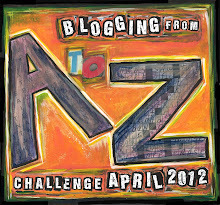 Posted on April 16, 2012, in #am writing (and all things writing related), April A-Z Challenge, Training Time (WIP) and tagged A-Z 2012, Names. Bookmark the permalink. 7 Comments. One of the questions I thought of for your Q post was how you name your characters. The logic you used for chosing Jane’s name is the same as Ian Fleming used to chose James Bond – he wanted as ordinary a name as possible. Not that I’m likely to be lucky enough to write anything decent, but I would use a pen name & already know what it would be. I think that’s down to insecurity on my part though – and the fact that I have a rare surname. If my story were terrible all my friends would know it were mine! Cool link to Ian Fleming – thanks for sharing that. Didn’t know Scrivener had a name generator, that’ll come in handy! I’m a little worried because two of my main characters have names starting with T, and having same-lettered main characters is supposed to be a bad idea… ah well, I’ll work it out somehow. It’s hard once you’ve named them to let go though, isn’t it?